It’s been a while since the last update on the tank, so I thought I’d catch everyone up. Unfortunately I had a bit of a mysterious die off about a month ago, I lost my porcelain crab and three trochus snails which was a bit devastating. I’m at a loss to explain the deaths, as the shrimps and hermits are absolutely fine. I thought it could have been due to starvation, 3 trochus snails in a 22 litre tank is a little much, but the porcelain crab seemed to be eating plenty. Nevertheless, the tank lives on, and I have had a bit of a rearrange! It is mostly to try and accommodate the ever growing corals. 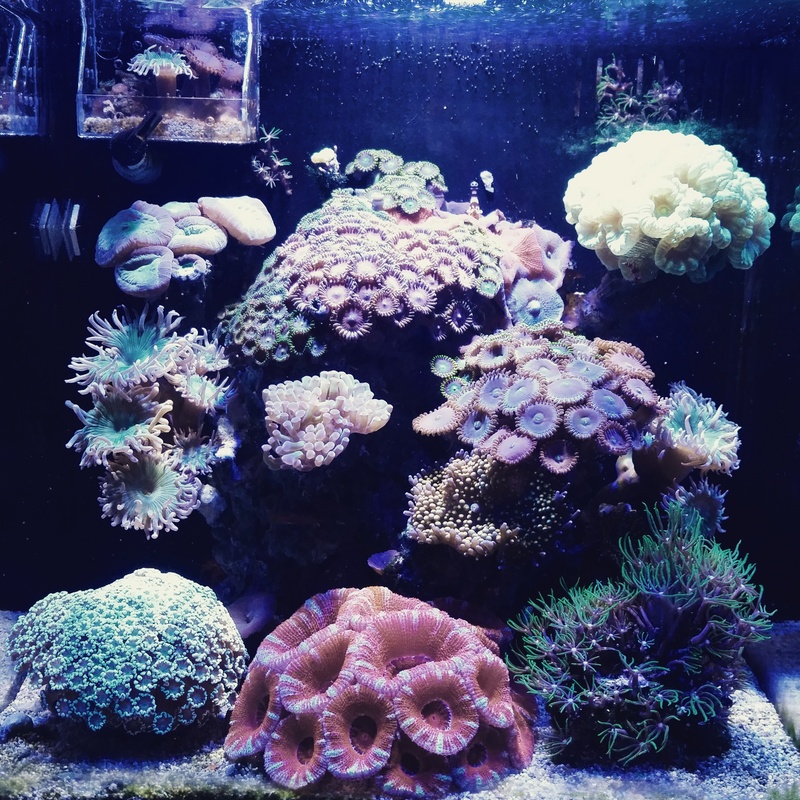 I have had to frag the duncan coral as it was getting rather large and upsetting my zoas on that left hand side. I now have two corals each with around 5-7 heads on, and each growing more! I’ve been really surprised and impressed with growth of the duncans, it seems that once they’re settled then they can just explode. The green trumpet coral and hammer have swapped places, again this was due to the trumpet getting too large for its spot in the tank. The hammer seems to prefer its new position, it gets more flow there and it now has three heads, growing from just the one when I bought it. It seems my alveopora is going through it’s bi-monthly sulk at the moment, its certainly not extending very far, hopefully it will snap out of it soon and get back to its best. You’ll probably also notice that I’ve made myself a little frag rack, it’s pretty tiny and I’m just using it to get zoas settled onto rocks before moving them on to other hobbyists, a tiny duncan head has also made its way up there for now! Thats all for now, I will look to update again soon, hopefully everything will have settled down and be looking spritely soon enough!